We’ll begin with the music today shall we, and not a favourite band of mine, Red Hot Chilli Peppers. They have a bit of a reputation for being a bit flat live. To be fair, I’ve only seen them twice, and, turned out to be one of the worst and best nights of my life. The first time the audience weren’t interested, and so after about 5 numbers, the band decided they were just going to play through their set and get off. The second occasion was just so different. The crowd were up for it, we were certainly up for it. I vowed never to see them live again,so as not to spoil the memory, not something I’ve found hard to keep to. But that’s not the reason I chose this track. I was sitting in the garden one summers day, just pottering, as Dads do. Alana was with me, she would be about 6 at the time. She loved being outside in the garden, either on her own or one of us, she always found something to do, keep herself happy. Lewis was in his bedroom, which overlooked the garden, all his windows open, it was that sort of hot afternoon. ‘Under the Bridge’ has such a recognisable opening, it began drifting out of Lewis’ window, and I began singing the opening lines. I waited for the cymbals to tap in, they didn’t and it was then that I realised I was singing on my own, not along to the record that I thought I was listening to. It was Lewis playing, and I think it was that moment that I knew he had finally got it. He’d been playing guitar for a few months, he could pretty much play most things, but there’s a huge difference between playing a tune and being able to play. The sound coming from his bedroom window had clarity, tone and feeling, and I for one could not tell the difference between his playing and the real thing. He’s never looked back since, even though his instrument of choice now is the Bass which pleases me more than anything. He’s a natural. The photo is from a little guitar shop, stuck down an alley in the middle of Exeter. You wouldn’t just come across it by accident, you would have to be seeking it out. Manson’s is a bespoke guitar maker, and if you get your guitars bespoke, they don’t come cheap. 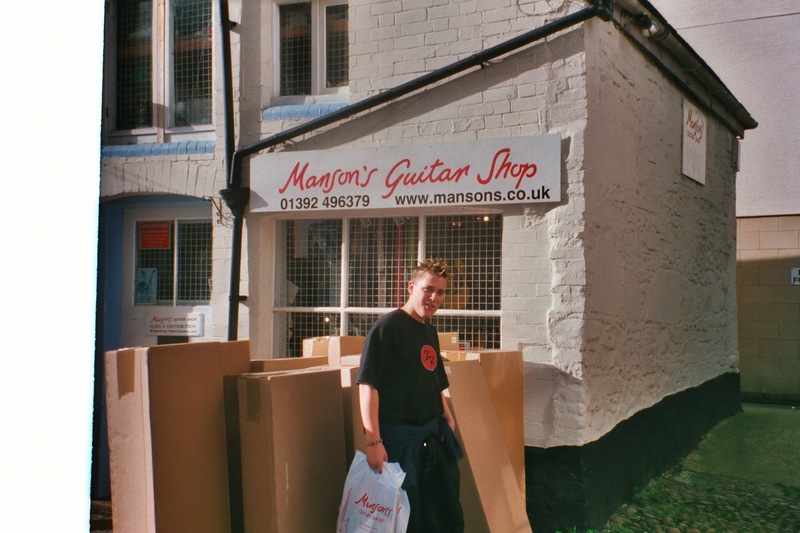 Strictly speaking, the guitars are made elsewhere, but this was the retail outlet for Manson’s and we had driven from Sussex as a treat for Lew, for Manson’s were the craftsmen who made guitars for Lew’s hero Matt Bellamy (Sorry @pmf182 ) from Muse. Bellamy likes his gadgets, and Manson’s are more than pleased to build his little toys into the body of his guitars, a quick look at their website will show you what I mean. It isn’t just Bellamy who holds Manson’s in such high regard, the walls of the, the workshop are adorned with broken guitars from guitar heroes past and present, John Paul Jones, Ronnie Wood, Brian Jones, Hendrix, Jeff Beck, to name just a few. 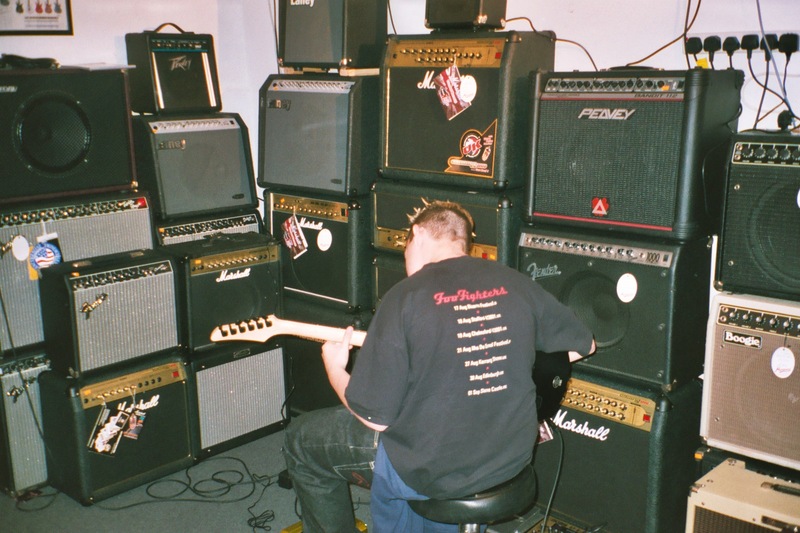 We spent hours at the shop, and the staff allowed Lewis to play whatever Guitars he wanted, and as you can see, had a multitude of amps to plug into and effect pedals to play with. The store has now moved to larger premises around the corner- we’ve not be there yet, maybe one for the bucket list. May I say a very genuine and heartfelt thank you to those of you who have made donations this year. Some of you I have not even met. You really are remarkable people and I thank you from the bottom of my heart. Everything seems to have settled down now health wise. For the majority of the time my pain is under control. I don’t think the fatigue will ever leave me now. I can’t begin to describe the effect it has on my life, and the terrible feeling of having no strength, it’s like my body is being switched off. The good news is that my scan came back as clear, the cancer has not progressed to my bones. I suppose that’s the first positive news for a long time. So for the moment all is calm. I’m back at The Christie later this week, chest x-ray this time. I’ve been having a bit of breathlessness so they’re just checking things out. Other than that, no treatment for the time being, still hopeful of a trial. The number of tablets I take daily seems to have reached ridiculous levels again, but at least they’re working. It is getting harder to keep track of what I should be taking I can easily understand how some people overdose or miss a dose completely. I have a 7 day pill container but you still have to remember what goes in them in the first place. I’m back to my CD’s now, onwards with the death list. Trying to listen to everything I own, all revoking memories. Not even got near MP3’s, I suppose I should be grateful I don’t have to work my way through a pile of vinyl ! This entry was posted in Be Clear On Cancer, Be Loud Be Clear, Beating Bowel Cancer, Bowel Cancer, Bowel Cancer UK, BUPA Great Birmingham Run, Cancer, Colorectal Cancer, Drug trials, Festivals, Health, Keith Richards, Manchester, Manson's, Manson's Guitars, Metastatic Bowel Cancer, Music, Never2Young, Palliative Care, Pleural Tumour, Red Hot Chilli Peppers, Springhead, Stage 4 cancer, Terminal Cancer, The Christie and tagged Beating Bowel Cancer, Bowel Cancer, BUPA Great Birmingham Run, Cancer, Festivals, Manson's, Manson's Guitars, Metastatic Bowel Cancer, Oldham, Saddleworth, Springhead, The Christie. Bookmark the permalink.